TRINITY TEMPLE – SCOTLAND’S OLDEST UNIVERSITY? 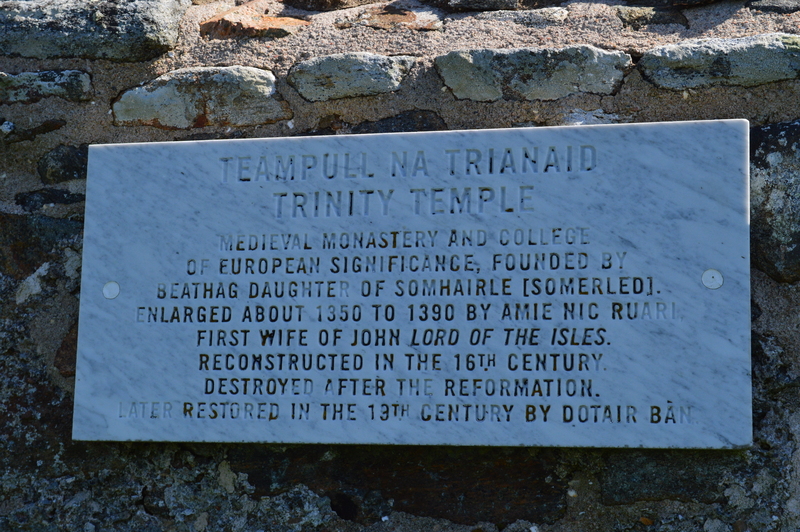 Teampull na Trionad (Holy Trinity Church) near Carinish on North Uist may be the site of Scotland’s oldest university. Standing on a gentle hillside, it offers views of the surrounding wetlands, out to the wild Atlantic. We visited in May, when the yellow flag irises were just coming into bloom and ewes eyed us suspiciously, as they nursed their lambs. 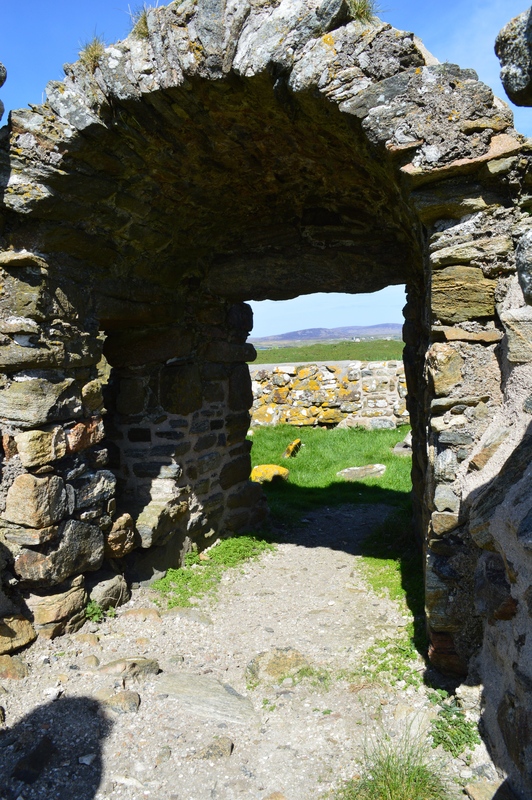 The ruined building (listed as of European significance) was once a medieval monastery and college, founded in the 1100s by Beathag, daughter of the warrior Somerled, according to the Book of Clan Ranald, written in the 1600s. After being rebuilt around 1350 to 1390 by Ami Nic Ruari, wife of John, Lord of the Isles, it was enlarged in the 16th century. It fell into ruin following the Reformation and, though later restored by Dotair Ban, in the 19th century, it was again in a ruinous state by the time it was visited by MacGibbon and Ross: compiling their Ecclesiastical Architecture of Scotland, published in 1896. 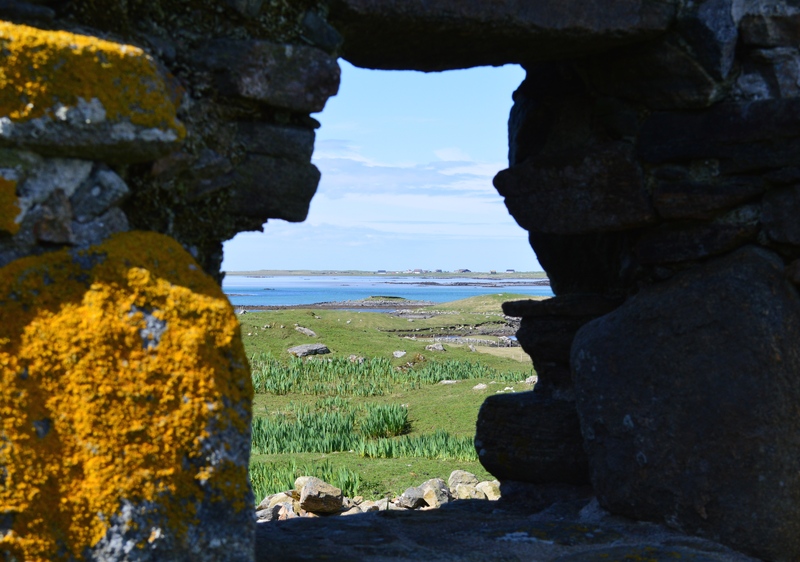 As the main A865 passes through Cairinis, near the southern end of North Uist, look out for a brown tourist sign. There is a small car park for visitors, but the boardwalk leading from there currently needs repair, so park by the chapel instead. The path leading to the ruins is just over a quarter of a mile. The site is open at all times and free of charge. You may notice another tourist sign, at the start of the car park boardwalk: the site saw Blar Chairinis (the Battle of Cairinis) in 1601. The sign is subtitled Feith na Fala (Ditch of Blood). One of the resident MacDonald clan decided to divorce his wife, of the Harris MacLeods, inspiring the arrival of her menfolk. The MacDonalds sought sanctuary within the precincts of Teampull na Trionaid, but eventually claimed victory over the MacLeods. It is said to have been the last battle fought in Scotland using only traditional weapons.